The Exchange Club of Niceville, in partnership with the Fisher House of the Emerald Coast, Inc., hosts the Field of Valor each year to honor service members from Florida that have been killed in action while serving in Afghanistan or Iraq since September 11, 2001. This week long event is free and open to the public. Over 350 large American flags, measuring 3 feet by 5 feet and mounted on 8-foot poles, will be displayed in perfect rows and columns on the grassy field at the north end of the Mullet Festival grounds in Niceville, Florida. Each flag bears the name of a service member who gave his or her life while stationed in Afghanistan or Iraq. For more information, call (850) 306-0131 or email us at Support@NicevilleExchange.Club. Volunteers help set up the flags, watch over the field and operate the information booth, or break down the flags at the end of the multi-day event. If you would like to volunteer for Setup, a 2-Hour Shift during normal operations, or Breakdown, then click the volunteer link below to register. By donating to the Field of Valor (see how below), you will be sponsoring at least one of the flags. After the event, you will have the option to keep the flags you sponsor. For non-local donors, we will be able to mail the flag(s) to you. A portion of the proceeds from this event will be presented to the Fisher House, helping them support military members and their families during hospitalization and treatment. Note: Sponsored flags will have a tag placed that identifies the sponsoring business. 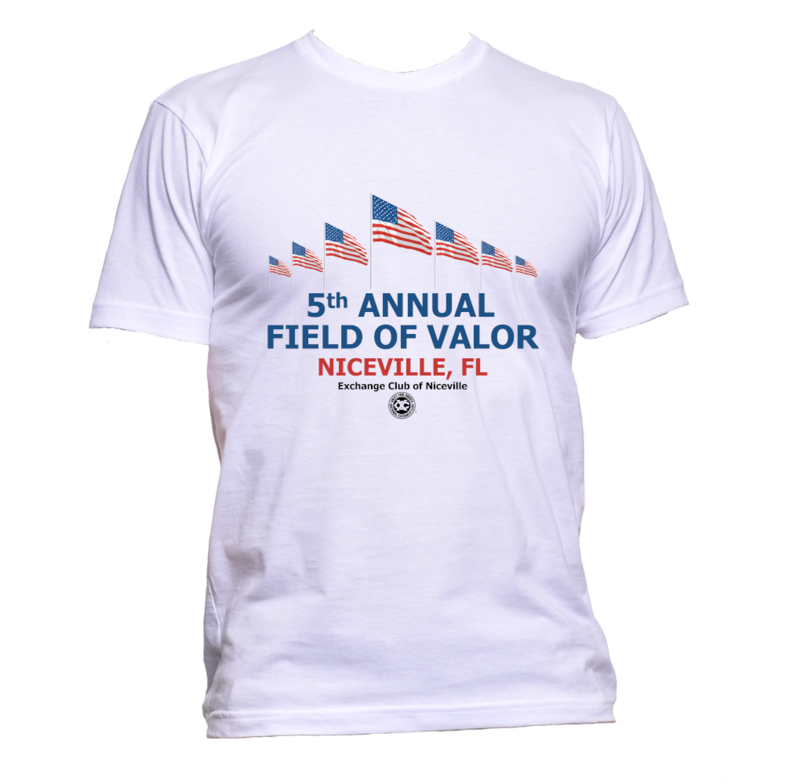 Show your support by wearing a Field of Valor T-Shirt. You can donate online through the link below using your credit card or PayPal. You can sponsor a flag. Bring cash or a check to the Field of Valor for drop-off at the information booth. If you would like to be a Premier Sponsor, complete and submit the form linked below.